FeeG is renowned for sophisticated styling and statement design, this creation epitomises that signature look by this celebrated Irish designer. 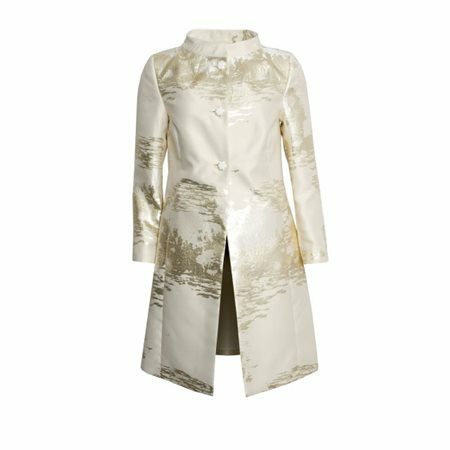 The knee length coat has been created from a luxurious cream and gold fabric that sits perfectly with three statement cream buttons and neat side pockets. The little Mandarin style collar provides a sharp finish and as you would expect this coat is fully lined with sumptuous cream satin lining. We recommend wearing this beautiful coat over the FeeG cream and gold tulip dress for a stunning look, perfect for a special occasion.